Repairing A Shower Valve In Sanford FL? In Sanford Fl our plumbers come across many plumbing issues one of them are when your house in Sanford Fl happens to sit for a while such as if it was just bought and sat for over 6 months or if you have a bathroom that is not used too often and the shower valves are of a single control type such as Moen, Kohler or Delta they have balancing pins in them and when they sit they get stuck in that position and you get very little or no water pressure in your Sanford FL shower this means that the cartridge needs to be replaced. Our Sanford plumbers can help you. You can find do-it-yourself videos online and try doing the plumbing repair yourself. They make it look very easy sometimes, it is other times it is difficult and you need to be careful not to break the plumbing in the wall. We suggest calling a plumber to do this because there is a lot of variables that can turn into a plumbing disaster. Once the cartridge is replaced we suggest to use the shower once a week, at least moving the shower valve from cold to hot getting the plumbing valve usage or it will happen again. If you have any questions you can call one of our plumbers 24 hours a day 365 at 407-393-0717. Drain Genie Plumbing Services serves Sanford florida / 407-393-0718 and these surrounding cities Orlando, Deltona, Lake Mary, Oviedo, Sanford, Winter Park, Apopka, Casselberry, Winter Springs, Altamonte Springs, Maitland and all of Central Florida. 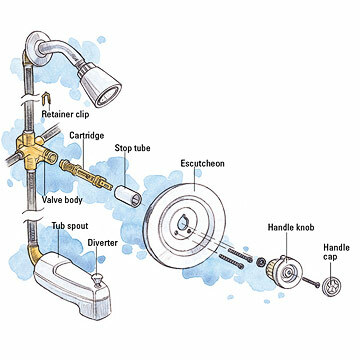 Home » Blog » Repairing A Shower Valve In Sanford FL?